NASA’s Apollo-Soyuz Test Project command module is seen as the final adjustments are made to its new display at the California Science Center. 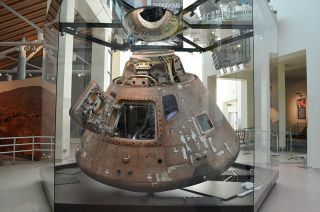 NASA's last Apollo command module to launch into space has shed its skin to provide a better look at the capsule, which was the first United States spacecraft to fly a joint mission with Russia. Apollo-Soyuz Test Project command module in its original Plexiglas case at the California Science Center in Los Angeles. Installation of glass panels for the Apollo-Soyuz Test Project command module's new display case at the California Science Center. See more photos of the new Apollo-Soyuz command module display at collectSPACE.